A Jeep that is dirty and nice! Despite popular opinion, it is possible to have a Jeep that is both pretty and nice! Learning how to wash a Jeep is your first step towards a Jeep that not only looks nice in between off-roading excursions, but is a requirement of the cosmetic care and maintenance of your Jeep. While many Jeep owners consider a healthy layer of dirt and mud a standard accessory, there remain a select group of Jeep enthusiasts who still appreciate a clean and shiny Jeep under normal conditions of daily use. Washing a Jeep presents unique challenges most car owners do not face. 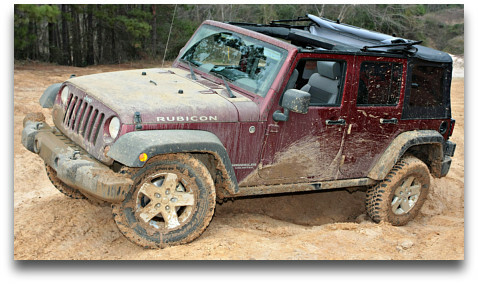 From heavy layers of mud to excessive dust, washing your Jeep can be a doable task with the right information. From specific techniques to specific products, having a Jeep that is both dirty and nice is a realistic possibility! While you may not be overly concerned with the appearance of your Jeep, you may be very concerned with retaining the value of your Jeep. 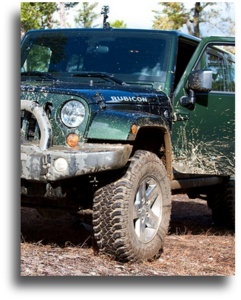 Despite the novelty and attention heavy layers of mud and dirt might represent to you as a Jeep owner, many Jeep owners do not consider nor understand the damaging effects of prolonged exposure to dirt and mud represent to the value of their Jeeps. Learning how to wash a Jeep with the right tools and products will allow you to enjoy both worlds when it comes to Jeep ownership. Basic steps to washing your Jeep. Unique tips for those problem areas of Jeeps. Whether you are washing a Jeep or a car, there are certain basic steps and requirements to the car washing process. Car washing is easily dismissed by many car owners as not only being a mundane duty of car ownership, but also of less importance. When it comes to Jeeps owners, this is usually only compounded by the fact that many Jeeps will venture off-road and Jeep owners often consider a healthy layer of dirt and mud as a badge of honor of their off-road prowess. But regardless, dirt and mud are harmful to both the paint on your Jeep, or any wax you may think is on your Jeep's paint. While this part of the process is the starting point and does not have to be over-thought, I have chosen a kit that not only has some very specific tools for safer washing and better results, but a kit that comes with all the essentials. Everything you need to perform a quality car wash.
Includes the top rated car wash shampoo from Chemical guys. Convenient wash bucket with snap on lid that can also be used for convenient storage and a work seat. You can buy all these items separately and take the time to source out the individual items, or simply buy as a kit and save time and money. Say good-bye to lint and scratching that your 100% cotton, "safe" bath towels are doing to your car. No more lint and scratches induced in the drying process from your bath towels. This version is bigger than the Meguiar's above. It is a larger size and many people will find that the larger sized drying cloths become excessively heavy as they soak up water. I actually prefer using these smaller micro fiber cloths for drying despite the popularity of the big, waffle weave drying cloths. These edgeless micro-fiber cloths are absolutely amazing in their ability to absorb, and I think they are even more gentle on your Jeeps paint. Jeeps represent unique problems mostly as a by-product of off-road use; dirt, dust, and mud cars don't normally face. Use the following tools of the trade to tackle more difficult tasks when washing your Jeep due to off-road use. A must have if you are serious off-roader. Blast off the heavy layers of mud, dirt, and miscellaneous "chunks" you brought home attached to your Jeep. Top rated pressure washer that won't break the bank. Despite the reviews that suggest an alternate tip, this unit comes with tips that have a wide variety of spray patterns and are more than enough for any needs you encounter. Another tool I consider a requirement; especially if you have a Jeep you take off roading. Ideal for use on wheels, tires, undercarriage, inside fender wells, etc. Another one of my time saving, professional "tricks". Regardless of whether you off-road or not, your Jeep will have bigger wheels and tires than traditional cars. This pump sprayer will save your hand from use of a traditional trigger sprayer. Especially useful if you are an off-roader as you can fill it with all the cleaner you will be going through as you degrease and clean the large areas of your Jeep. Very inexpensive and the perfect size for usability and effectiveness. The very one I use professionally. Simply fill with your choice (see below) of your favorite cleaner, pump to create pressure, and off you go! A popular cleaner that is both effective and safe. Concentrate so you can custom blend based on your needs. Fill in your pump sprayer from above according to your dilution ratio and spray away! Use on your engine, inside fender wells, wheels, tires, etc., etc. To Dress or Not to Dress...that is the question. "Dressing certain areas of your vehicle can not only cover up the grime stained areas that cannot be cleaned away, but can serve as a sacrificial barrier." By applying this dressing to these areas, it creates a barrier or coating that the dirt, mud, and dust now lands on that can be washed away each time you wash your Jeep. Yes, the trade-off is that by using a dressing, people naturally conclude that it will "attract" dirt. While no dressing actually becomes magnetized and will actually attract dirt, it will create a greasy surface that dirt will stick to easier. The real answer is that by applying dressing, you create a very dark, shiny surface that dirt now shows up against better than if you left the area untreated. But once again this will only happen if and when you go off-roading. In the meantime your Jeep looks amazing by using some form of dressing (see below) to enhance these dirt stained areas of your truck or Jeep for that "enhanced" look as you are driving around town on paved roads. What I recommend is that you get this smaller size of a quality dressing and dilute it down 4:1 (one part dressing to four parts water). You can then put into a traditional trigger spray bottle and shoot into all the dark recesses of your Jeep: fender wells, undercarriage, suspension parts, engine bay, etc. Use straight (neet) for tire side walls for a nice shine with some added protection. I was asked by a Jeep enthusiast to create a page specifically designed for Jeeps. My natural conclusion was to star with the basics of how to wash a Jeep. My hope is that you have learned a new trick or two that will not only make your life easier, but simpler while producing better results for you in the end.